Cayosoft Administrator manages various systems on-premises, in a hybrid configuration or in the cloud through a set of extensible modules. 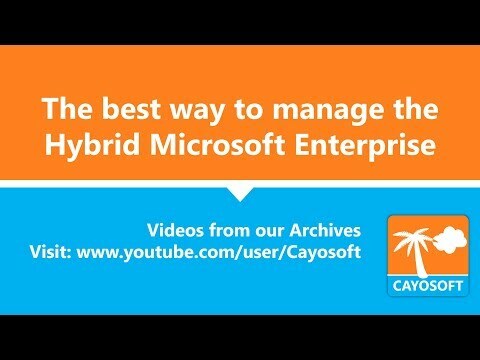 Cayosoft Administrator™ delivers the missing management layer needed to simplify Active Directory, Exchange & Office 365 Administration in today’s modern hybrid environment. With automation and IT Rule enforcement you save time and money by allowing administrators or help desk staff to concentrate on more important matters. Indispensable to administrators, help desk, security admins and auditors, Cayosoft Administrator helps sustain security, compliance and efficiency twenty-four hours a day, seven days a week.For more information, visit the Cayosoft Administrator product page. Looking for Group Management Automation? Relying on memory, potentially error prone manual procedures or downloading and running suspicious and possibly dangerous scripts is no way to run your IT business. Cayosoft Administrator unifies your hybrid environment under a single console and provides the IT controls demanded by auditors and compliance officers. Cloud and Mobile have also made day-to-day administration and adherence to IT Business Practices more complex and costly. The slew of separate administrative interfaces (or sometimes there are no administrative interfaces) means jumping between disconnected islands of administration that takes more time, increases errors and costs while reducing Admin Productivity. Administrator solves these problems with pre-built rules designed to efficiently perform key administrative tasks so you can concentrate on the more important aspects of IT. Cayosoft Administrator also has built-in rules that enforce Cayo Suspend’s Object Retention Policy to efficiently complete user and group deprovisioning. This is critical because user and group objects must be retained for between 30 and 90 days from when the object is suspended so that it is available for compliance or security audits. Because it would be easy to forget, Cayosoft Administrator will scan Active Directory and identify the users and groups that are scheduled for permanent deletion. When a user or group passes the assigned retention period Cayosoft Administrator deletes the object and then audits the date and time the permanent deletion occurred. On-going IT Policy enforcement is critical for maintaining security and for sustaining legal or regulatory compliance goals. Cayosoft Administrator will keep an eye on important systems like Active Directory to make sure that key IT business policies are being enforced. Optionally, Cayosoft Administrator can be configured to take action in the target system to correct policy violations. Cayosoft Administrator customers can quickly download new policies from the Extension Center and extend Cayosoft Administrator with powerful new automation and management capabilities. Each of these downloadable extensions has been designed by experts combining dozens of years of and thousands of customer feedback requests. Email notifications is built into Cayosoft Administrator allowing administrators, help desk staff, managers, mobile or desktop users to receive important alerts and information when needed. Email alerting is an optional part of each alert scenario and works with popular SMTP Servers like on-premise Microsoft Exchange or cloud based Office 365 and Google Mail. At the heart of Cayosoft Administrator is data discovery. Cayosoft Administrator works by connecting and querying a source system like Active Directory, an Excel CSV file or a Cloud Application. Next Cayosoft Administrator filters, sorts and analyses the information to determine if any action is needed.